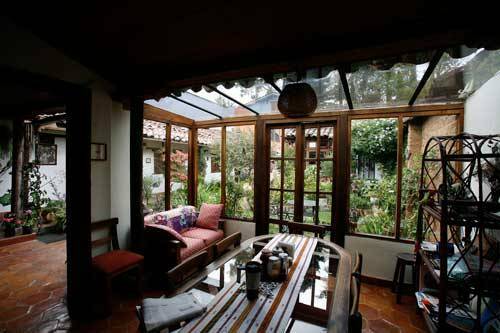 Bela's is a lovely bed and breakfast centrally located in the historic town of San Cristobal de Las Casas. We are one block from the walking street, one-half block from the Santa Domingo Church/artisan market, three blocks from the zocalo/central square and three blocks from the town market place. We have four lovely bedrooms, all very cozy and homey, and wonderful service. 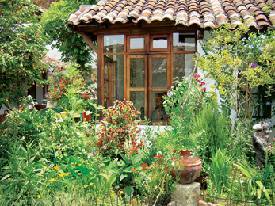 On the courtyard garden there are two bedrooms with views of the garden, one with private bath. There are two bedrooms, each with private bathrooms, up the terrace with views of the city. The top room has a balcony with a breath-taking view, and the lower room has a sitting area and king-size bed. 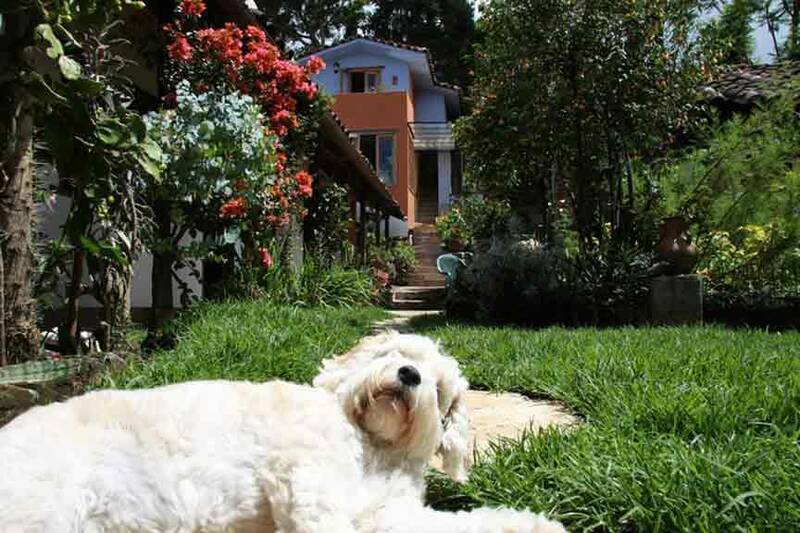 We are a family with three adorable dogs, a lovely home and a gorgeous garden. For your convenience we have high speed WI FI internet connection. We also are lucky to have Manuela, who may be the best cook south of the Rio Bravo! Airport pick ups and drop offs can be arranged with a trusted driver. We serve a full breakfast to fulfill your desire. There are three beautiful dogs to welcome you whenever you come "home". We have a very nice library in English and a small one in Spanish. There are many sitting areas on the property and there is a lovely chimanea in the dining room for cold mornings or afternoons. We offer WI FI and telephone service. We have a laundry service for a fee, and best, working with us is Teresa who is an on-site masseuse, and is available for deep tissue massage, one and a half hours, for 275 pesos. Teresa's mother is a fantastic cook and you can join us for lunch, Monday through Friday for 65 pesos. A gorgeous second-floor room with a view of the city, a balcony and ensuite bath. A large room with king bed, sitting area, view and ensuite bath with tub. Sleeps four. A cottage room in the garden with view of garden from bed, ensuite bath. 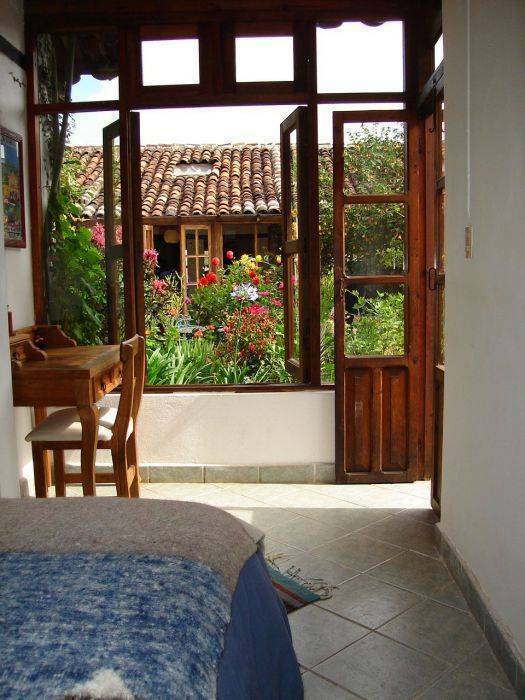 A small room on the courtyard with view of garden and sharing a bathroom with a separate shower, two WCs, and two sinks. 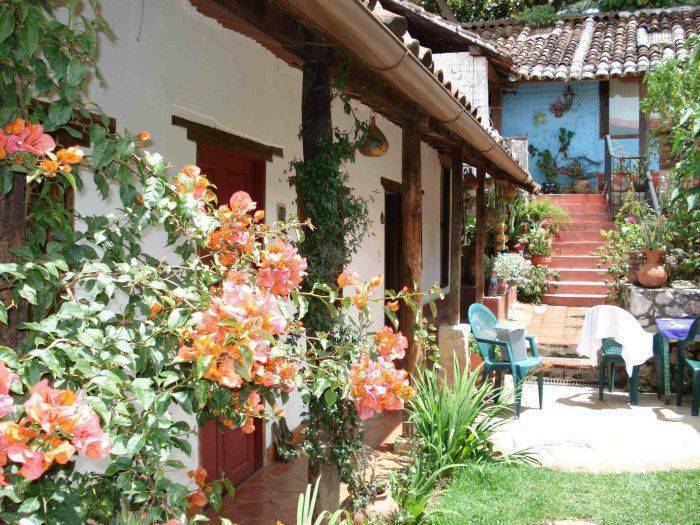 Bela's bed and breakfast is located in the second oldest neighborhood in San Cristobal de Las Casas -- El Cerrillo. The pedestrian street is one and a half blocks away, the main market is three blocks north, the center of town is four blocks south. The local artisan market is located at Santo Domingo church which is one-half block from Bela's. The are many restaurants, shops, cybercafes, coffee shops and museums within five minute's walk from Bela's. $15.00 for extra person in room. Ten percent discount available for long-term stays. One night's deposit to reserve the room. One month notice for refund of deposit. If you are driving you will come in on the main highway and arrive at a sign that says "Centro Historico" -- you will go north (there will be an indication) on that street which is named "Insurgentes". The bus station will be immediately on the right. You stay on this street and go past the zocalo and cathedral (on your left) three blocks. You will arrive at Calle Dr. Navarro. On the left across the street will be an outdoor artisans' market and there you will turn right. Our house is the first house on the left that is white and blue. Directly across the street is a parking that you will turn right into and park. The house doesn't have a sign but has a #2 and big wooden doors. If you arrive by bus, you will take a taxi to "Doctor Navarro, numero dos, por Santo Domingo". If you arrive by airplane you will need a ride to San Cristobal. We have a taxi driver for pick ups and drop offs if desired. If not, get to San Cristobal and tell the taxi driver, "Doctor Navarro, numero dos, por Santo Domingo, por favor". We have collective buses and taxis. A taxi within San Cristobal as of April, 2009, is 20 pesos anywhere in town. A collective bus is four pesos fifty centavos.